This is probably completely obvious. But sometimes I have days where I realize how extremely lucky I am to be surrounded by the best people. Do you have those days, too? I hope so. Unfortunately, I (Kate) was dealt an epic disappointment this weekend. Epic in the way that makes you curl into a little ball and ugly cry. For an hour and a half. Approximately. In the grand scheme of things, this news was not the end of the world. But you know how these things go. They feel so hugely awful at the time, you know? Like everything you have going for you doesn’t matter because you don’t have this ONE THING THAT YOU WANTED SO MUCH. So you ugly cry. And you maybe drink too much Jim Beam. And you wallow in how terrible this thing is that happened to you. I don’t mean to be dramatic. Just trying to paint a picture of how I felt approximately 36 hours ago. It was bleak. The Accountant was in town, and even his offer to pick up pancakes for me didn’t pull me out of my despair. All I wanted to do was quietly cry and cuddle with Kirby and drift in and out of sleep. Maybe no one else deals with disappointment this way. I’m not claiming that this is normal. I get overly attached to ideas, so it makes when they don’t come to fruition all the more crushing. Anyway, the point is this: my friends. They are great. First, my roommate sat up with me for a long time after I got the news and listened to my irrational, emotional thoughts. And began to nurse my ego back to health with her assurances that yes she still liked me and no this did not mean I was worthless and yes I was still smart and funny and cute. In the morning, a good friend checked in on me and did some more ego-nursing. But more than that, was just incredibly sweet and kind and awesome. Compliments from my roommate and friend aside, they both reminded me that I have good people in my life. And that in itself is something to be proud of and thankful for. Then, tonight, I had plans to watch Buffy with another good friend. And you know, what? I will swear til the day I die that there is nothing better for the soul than a good TV date with a wonderful person. We watched Buffy and we chatted and we shared a bottle of red. And I laughed and he laughed and we pet my cat and life was good. As he was walking out of my apartment tonight, I realized that that epic disappointment that seemed insurmountable just 24 hours ago was actually not all that bad. Yes it hurts, and yes I wish the result had been different. But I had a pretty good day with some pretty great people. What more can you ask for? And then, to complete the healing, I have to bake something. Preferably something pretty. 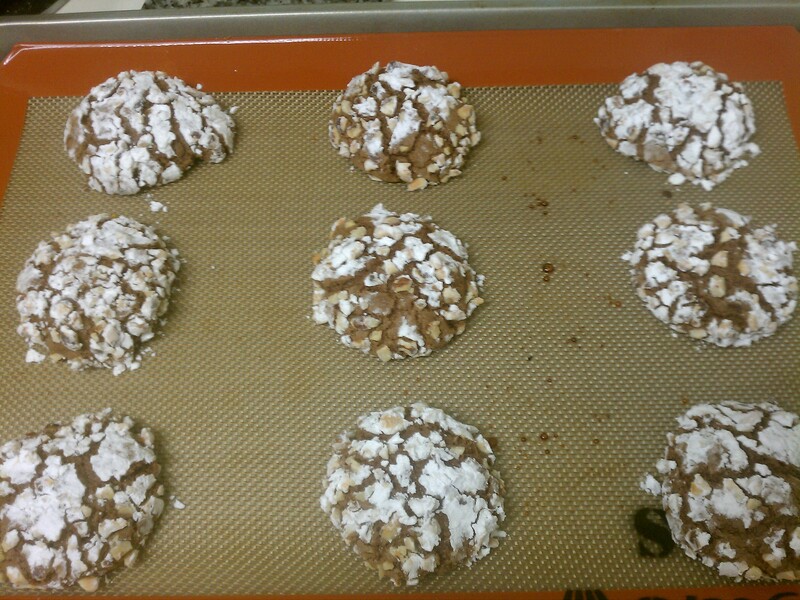 Enter these beautiful cookies I saw on Brown Eyed Baker. They crack on top. 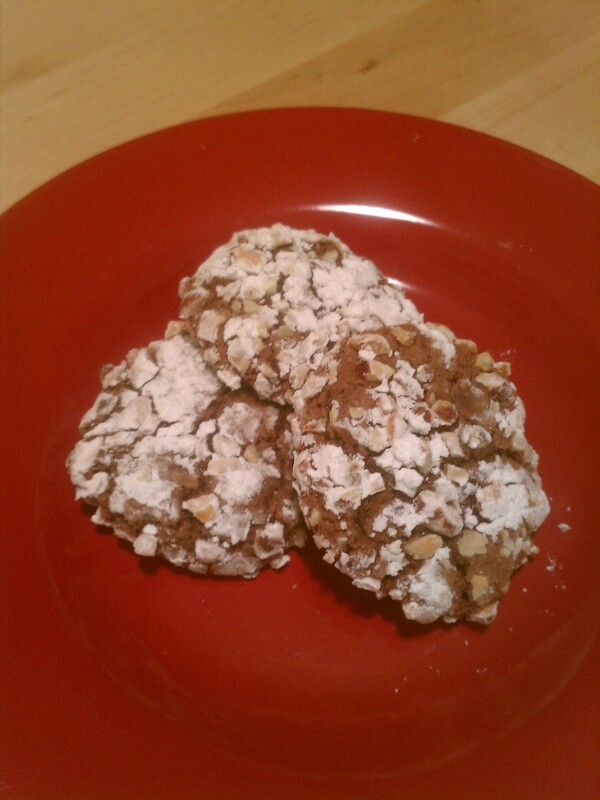 I am helpless in the face of cookies that crack on top. 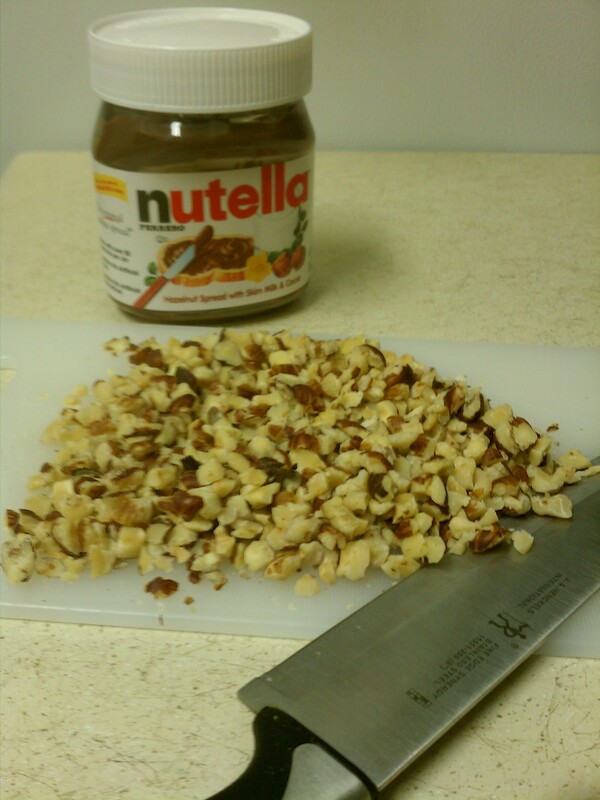 Combine dry ingredients in a bowl and set aside. Cream together butter, Nutella, and sugar. You want to make sure they’re all well mixed. So let it go for a few minutes til fluffy. Add eggs and vanilla and mix until well combined. Make sure to scrape down the sides of your bowl here. Alternate adding flour mixture and milk, starting and ending with flour (so: flour, milk, flour). Mix until just combined. Refrigerate your dough until it is firm. This will take at least two hours and can rest for up to 24. 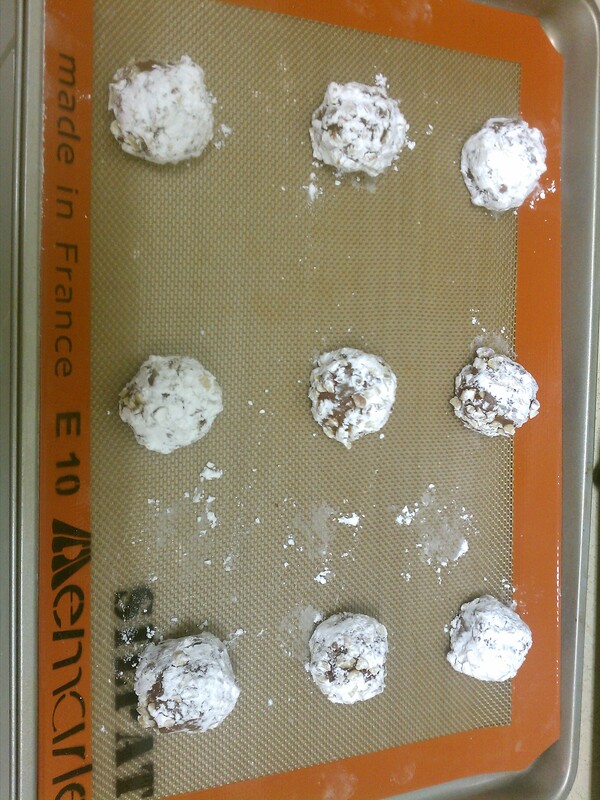 Preheat your oven to 375°F and line cookie sheets with parchment. 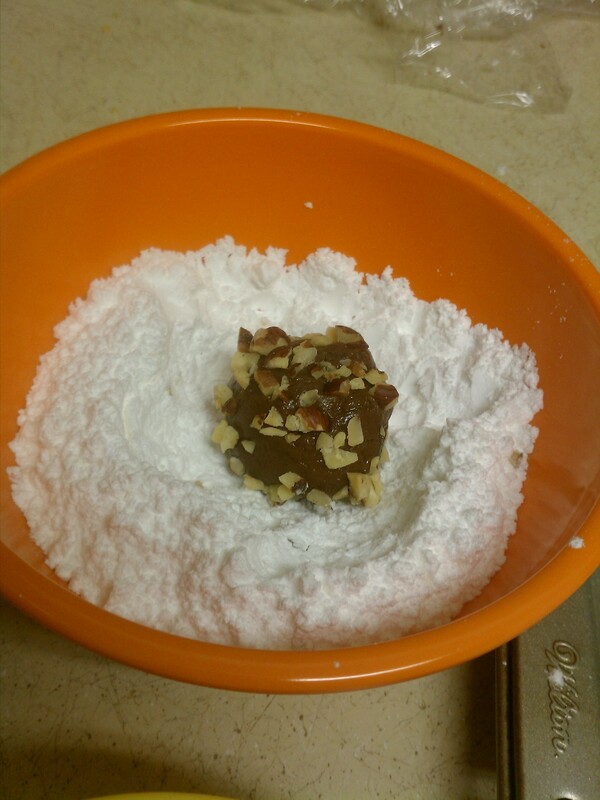 Place hazelnuts and powdered sugar in separate bowls. Scoop about 2 tablespoons of dough, form into a ball. 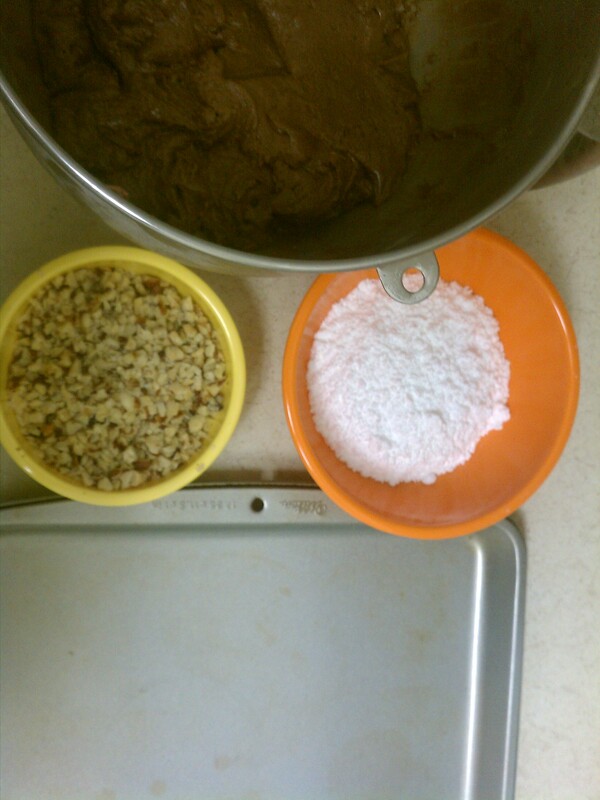 Roll first in the hazelnuts, then in the powdered sugar. Place about 2 inches apart on cookie sheets. They won’t spread much, I promise. Bake for about 10 minutes or until the edges are firm and the middle still looks doughy. Cool for a few minutes on the baking sheets, then move to a wire rack to cool completely. Sorry to write a mushy post. At least I don’t do it all the time, right? Thanks for indulging me. You are the best. Friends are the best. We are the best.